Mormanity - a blog for those interested in The Church of Jesus Christ of Latter-day Saints: The Smoking Gun for Joseph's Translation of the Book of Abraham, or Copied Manuscripts from an Existing Translation? We turn our attention today to the Book of Abraham Manuscripts. Manuscript A is in the handwriting of Frederick G. Williams, and Manuscript B in the handwriting of Warren Parrish, who was not hired as a scribe until October 1835. 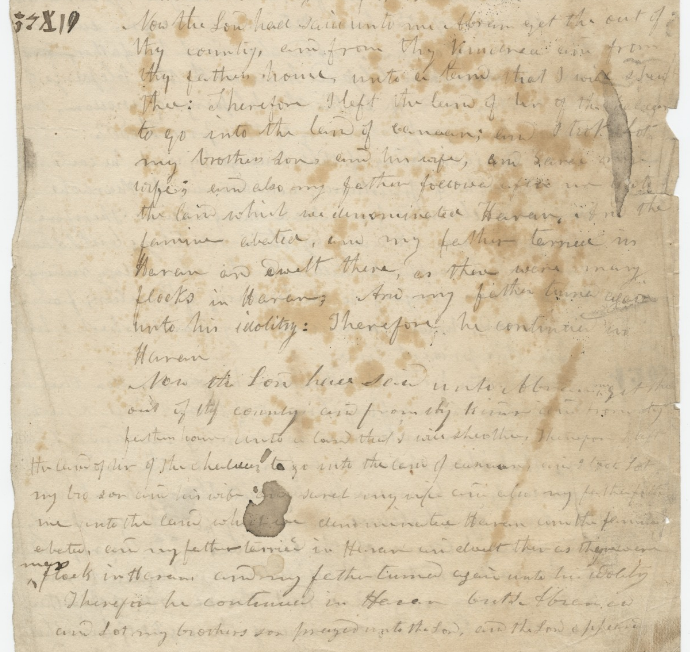 Manuscript C is in the handwriting of W.W. Phelps for the first 20 lines giving Abraham 1: 1-3, and then it switches to that of Warren Parrish again. Brian Hauglid, Dan Vogel, and others have insisted that these give us a "window" into Joseph Smith's translation process. And there's certainly a compelling case to be made, for two of these documents, Book of Abraham Manuscript A and Book of Abraham Manuscript B, appear to have been simultaneously dictated by two scribes. They both begin with the very same mistakes and corrections, as if the speaker were catching the errors and correcting them on the fly. As we look on the first page of both manuscripts, there is clearly an oral process going on, especially when we see different spellings for unusual names. So this must be the window we need into Joseph's translation, right? Joseph must have been the one dictating, and these documents show that the translation must have begun in October or November of 1835, and that it was done using characters considered in the Egyptian Alphabet and Grammar, not a lost manuscript. We see the original Book of Abraham text being created on these manuscripts, nicht wahr? Perhaps nicht. There certainly appears to be an oral process occurring and simultaneous copying, at least at the beginning of Manuscripts A and B. But was it really Joseph dictating? And was this dictation of text that was being revealed/fabricated on the fly, or was it dictation from an existing manuscript to help two scribes make a copy? For those who assert this represents Joseph dictating his new translation, is there any evidence that Joseph was known to dictate to two scribes at once while translating or giving revelation? My memory may be cloudy here, but I only recall Joseph using one scribe at a time, not two. While there appears to be an oral process, at least initially initially, the manuscripts later show evidence of being visually copied from an existing manuscript, and not being created in a purely oral process. For example, Manuscript A at page 4 ends with a strange duplicate section where a lengthy section, Abraham 2:3 to 2:5, is repeated. This phenomenon, "dittography," is characteristic of copying a text and mistakenly looking back at a previously copied region as one continues. It's a common scribal error. It would be highly unlikely, even virtually impossible, to redictate this much text word for word in a purely oral process, especially if one were in the process of making it up on the fly. But this kind of error could easily occur if one were copying a document. But yes, it could also occur in an oral process -- if the one giving dictation were reading from an existing manuscript, though that seems less likely than simply copying from a text one can see. These mistakes and corrections are hard to justify if someone already has a sentence in their head. For starters, how does "mine appointment" get turned into "the appointment"? Note that the final sentence in question has both "mine appointment" and "the appointment" right after it. When copying by hand from an existing text or reading aloud from an existing text, skipping ahead (or looking back) to a similar phrase and momentarily confusing the two is an easy and common mistake to make. Switching a nearby "the appointment" for the immediate "mine appointment" would be completely understandable, if one were working from an existing text. It's also possible that if the reader were not used to putting "mine" in front of a noun, one could also subconsciously make it more natural by reading "the" for "mine." The fact that "mine" ends with "ne" which can look like "he" in "the" might have contributed to the error. But in any case, looking at an existing text and copying or reading could readily result in this error, whereas if one had decided to speak of "my appointment" but in old fashioned language, it's unlikely that one would slip and just say "the" instead, when the context of the sentence demands a possessive. This is an error most likely due to working with an existing text. If the person reading the text to our two scribes had the complete text of Abraham 1 in hand, helping them to make copies for their own use or study, perhaps, then if that person had previously read verse 2 or were familiar with it, then memory of that previous "whereunto" regarding Priesthood rights could easily cause one to stumble and say "whereunto" instead of "unto." The same could happen for someone making a copy by hand, but since two manuscripts from two scribes have the same error, it would seem that they are either taking notes from dictation or deliberately preserving scribal errors from a previous text, which would seem unlikely. Two Scribes in a Joseph-free Scenario with Williams Parrish as Reader? If Manuscript A and B reflect dictation and an oral process, it is natural to assume that Joseph or someone else was dictating to his scribes. Joseph did often dictate to scribes (or rather, to one scribe at a time, not two at once as far as I know) when receiving revelation and performing "translation" by whatever means. But we should also consider another possibility. It is not necessary that Joseph or anyone else was reading out loud to the two scribes. One of the two scribes could have done that. One of the scribes with a document in front of him could have been reading aloud for the benefit of the other scribe (or theoretically even more scribes) a few words at a time, alternately reading and copying what he just spoke. Whatever was going on, it didn't last, for one scribe, William Parrish, the scribe working on Manuscript B, stopped early after writing "who was the daughter of Haran" from Abraham 2:2. However, Frederick G. Williams kept on writing on Manuscript A. It was at this point where something changed, as is visible in the image above (Manuscript A, p. 4), perhaps due to Parrish's departure and a change or interruption associated with that. Perhaps the key change was because Williams one person no longer had to read out loud and so Williams could now just copy text directly without hearing the spoken text and without thinking about what he had just heard. It was at this point where Williams writes Abraham 2:3-5, and then creates a massive dittography blunder by copying those three verses again, word for word (with a couple of minor typos and "bro son" instead of "brother's son"). The change also includes writing all the way to the left margin of the page instead of respecting the column holding occasional Egyptian. Update, April 16, 2019: In my next post, I will examine the typographical errors in proper names that occur in both manuscripts. Based on that data, it appears much more likely that Parrish rather than Williams was the scribe who was reading from a manuscript (or at least could see the manuscript being copied), for he has very few typos in proper names but Williams abounds in them, which would be reasonable if he were hearing and trying to write unfamiliar names. Of course, a case of dittography this big makes no sense for a scribe copying dictated text or writing text that the scribe has read out loud to someone else. In proofreading, I have long noticed that I catch errors, especially redundancies, much more readily when I read the text out loud. Dittography is less likely to happen when we're reading and hearing what we are writing. But if Williams were doing the reading and then stopped reading out loud after Parrish left or took a break, But if Parrish were reading the manuscript and then stopped or left, Williams could have simply taken the manuscript for direct copying and could have easily fallen into the common transcription error of jumping back to something already written, giving us a significant case of dittography that would be unlikely to miss in a more oral/audible process. And that means that Williams was copying from (and Parrish previously may have been reading aloud from) an already existing manuscript of the Book of Abraham. Whoever was dictating to the scribes, there appears to have been an audible process with corrections ordered by the one giving dictation, at least at the beginning of Manuscripts A and B. A change occurred at or by the point where Parrish stops writing, for then Williams shows an extreme case of a classic scribal copying error as he repeats three full verses, apparently without noticing. At this point it is clear that Williams is copying from an existing text, and it is likely that the entire manuscript was based on copying from an existing text, one that was either being read to the two scribes, or one that Williams was reading and copying from with Parrish one scribe read aloud initially while both made a copy. The dittography at the end points to copying from a manuscript, while the mistake with "unto" becoming "whereunto" at the beginning also makes sense if the dictation were from an existing text that had Abraham 1:2 and its "whereunto" in a similar context. From beginning to end, these documents support the notion of dictation and/or visually copying from an existing Book of Abraham manuscript, not the creation of that book. Rather than giving us a window into Joseph's translation process, these manuscripts may be giving us a window into someone's dictation process and a window into somebody's effort to use an existing translation to do something -- reverse cipher? decoding Egyptian? gaining insights into a mysterious "pure language"? What that something is remains unclear to me, but it does not seem to be creating the text of the Book of Abraham translation. So not only do we have missing scrolls and missing original texts from the Book of Abraham translation, we may also have a missing speaker who apparently read out loud to the scribes, though that speaker may well have been Frederick G. Williams Warren Parrish himself. In any case, there are multiple clues pointing to an earlier existing translation being used. Is there evidence that he had multiple scribes simultaneously copy an already existing document? I’m not sure what your question does or doesn’t prove. Just because I haven’t sent a Tweet before, doesn’t mean I can’t start tomorrow. Also, if Parrish were being prepared to take over scribely duties, which we know he did, this would be a great learning/practice time for him. I think you are incorrect in your assumption. There are two different types of mistakes present in your examples. One is a strikeout after the fact, "mine" for "the," and the second is an in-process correction—one has said the wrong thing, corrected it immediately, and continued with the sentence (unto for whereunto). Both of these examples are consistent with real-time dictation of text. The words “mine” and “the” look nothing alike. I’m not sure how someone would mistake one for the other when reading. Now someone who has just dictated a sentence and had his scribes read it back will realize his mistake and have the scribes strike “the” and insert “mine” instead. As for whereunto and unto, it is clear that this correction was made in situ. It is easier for me to believe one misspoke than misread, especially considering the previous correction just discussed. I’m not sure that you could conclusively prove this one either way. The dittography is easily explained. If one of the scribes needed to leave, the other scribe would continue writing what was said. The absent scribe would want to catch up his version of the text once he returned, and so would want to copy the text of the scribe who remained. In copying his missing text, a dittography is committed. One need not throw out all of the other evidence to account for this anomaly. Your comments on dittography puzzle me. Are you looking at the same document? Parrish stops at Abraham 2:2 and does not come back to finish anything. Williams after that point completes three lengthy verses and then writes them a second time, a classic mistake for scribes copying a manuscript, but a bizarre and miraculous blunder if Joseph is just making stuff up on the fly. Seriously, the only plausible explanation is that Williams copied from an existing manuscript at this point. He may very well have been listening to some reading from that manuscript before that point, and it's a reasonable hypothesis that the reader was Williams. Looking at the typos and variations in spelling for proper names suggests that Williams had access to the existing text, keeping his spellings of proper names very consistent, while Williams has a high level of variability, consistent with spelling names based on what one hears being read out loud. "The" and "mine" can look more similar than you realize, but the key here is that in the hypothesized pre-existing text, if it is very similar to our canonized text today, the phrase "mine appointment" is almost immediately followed by "the appointment," creating a perfect setup for a classic mistake in copying and reading. The eyes can skip ahead to the following phrase with "appointment" and read "the" in front of it before catching the mistake. Both errors make more sense if an existing text is being used, and the final dittography almost demands that. "One need not throw out all of the other evidence to account for this anomaly." What evidence is being thrown out? The details in the manuscripts ARE the evidence for what went on here. Even we just assume for sake of argument that everything you said is true, I still see an elephant in the room that doesn't ever seem to be acknowledged. In either case, these manuscripts serve as extremely powerful evidence that these folks believed the Book of Breathings was the source of the Book of Abraham. Why else put the Breathings characters in the left column? Whether these documents were created during the initial translation, or were copied after the initial translatoin, it is painfully obvious they believed one came from the other. Now, you can try (without any compelling reason to do so that I can see) to separate Joseph from the creation of these documents, and blame it all on the scribes with the suggestion that they simply were mistaken as to the source. But this still doesn't strike me as a very good apologetic. For me at least, it is very hard to accept that during the translation process none of these scribes got an indication of which papyrus Joseph believed he was translating from. At least one of them reports being there when Joseph identified a particular papyrus as the Book of Abraham, and thus very possibly would have remembered which one it was. But even if we do wishfully propose that during the entire process of translation, and creating an Egyptian grammar, they never did learn or get to see the papyrus that Joseph identified as the Book of Abraham, I would still find it hard to believe that these scribes would go to the trouble of attempting some sort of reverse translation without first being sure that they knew which document Joseph had identified as the Book of Abraham. It all strikes me as an obviously desperate attempt to avoid the very painfully obvious conclusion that the Breathings text is what they believed the Abraham text was coming from. The elephant in the room is how anyone can think that a single character in the margin next to a large block of text can possibly represent how Joseph did the translation? While there are several theories one can debate for the purpose of adding characters (reverse cipher per Schryver as a tool for encryption of English, somehow exploring W.W. Phelps' pure language idea which involved characters in the Grammar and Egyptian Alphabet not even found on the scrolls and definitely not Egyptian, decorating the text, finding mystic meaning in some characters), it is clear that these manuscripts are being copied from something else and cannot possibly represent the work of translation in progress. My April 20 post shows a document from Phelps that indicates he thought (at least initially) that four lines of English corresponded to a "translation" of 3 lines of Egyptian, with no evidence that he really thought his roughly 50 English words were from a single character, even though he later emended the document in very light ink to indicate that the translation was "in part." The brief fragment of the Sensen text related to the characters in the margins does not match the description of witnesses of the long scroll that Joseph translated. There's no evidence that any scribe thought was translating just a few characters to get the whole Book of Abraham. There's strong evidence that the Grammar and Alphabet were derived from the Book of Abraham, not the other way around, and no evidence that Joseph used that tool for translation. The real elephant in the room is the obvious fact that if someone is preparing a "Grammar and Alphabet" to decode a language, they naturally must begin with some known translated text that they can then use to elucidate how the language works. So what were they working with to get started on that project? Is there any possibility other than an existing translation of at least some of the Book of Abraham? It came earlier. What we are looking at in these manuscripts, too, are copies of an earlier existing translation, not the work of translation. So the elephant in the room is how one can argue that Joseph used the Alphabet and Grammar to produce the documents that were their source, that predated them, and that did not need such a tool, as Joseph had ably demonstrated with his production of the Book of Mormon and the Book of Moses. He and others wanted to learn, certainly, and may have hoped to figure things out for themselves -- after the revelatory had been already been done or partially done.